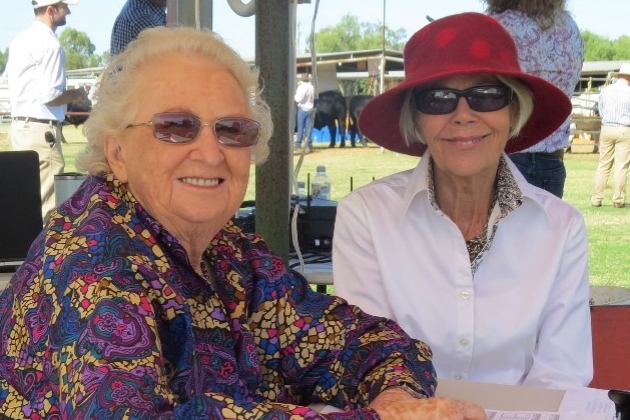 The stands were packed at the 12th Annual New Dimension Braford sale held at Bell Showgrounds last Saturday. The quality yarding led to a very pleasing result for vendors and purchasers alike. 15 registered bulls averaged $8,600 to top at $15,000. 30 registered females (12-22mths) averaged $2,016 to top at $3,500 three times. 7 commercial females (9-10mths) averaged $1,185 to top at $1,400. All Sold to: Repeat buyer, Stewart Anderson, Devils Nest, Theodore Qld. Mr Anderson purchased a total of 14 top quality heifers. 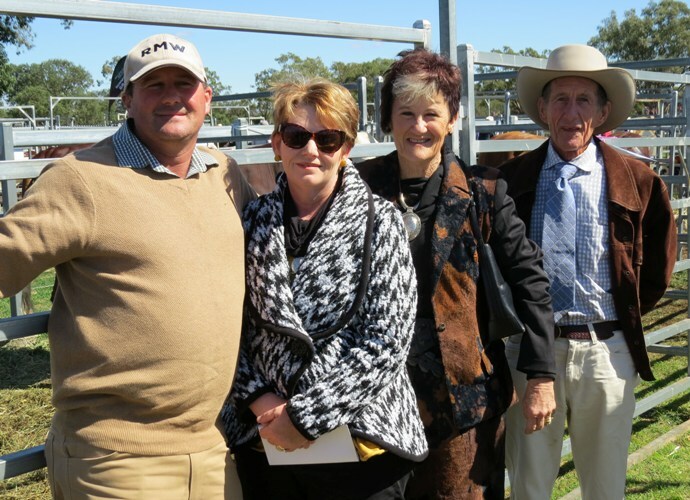 A presentation Dinner for the Callide Dawson Beef Carcase Competition was held on the 24th June. The winners were announced and awarded their prizes. Out of the 506 head competing there were 8 Brafords. The competition is in 2 sections, being the grain fed and the grass fed. The Galloways from “Ascot” Banana competed in 2 classes of the grass fed section and with 2 of their younger steers won Champion and Reserve Champion Steer out of the 266 steers competing in the 3 eligible classes. The 2 steers were purebred Brafords and were up against the Brahman, Brangus, Bazadais, Senepol, Angus, Shorthorn, Charbray, Santa Gertrudis and Droughtmaster purebred cattle along with many crossbred cattle. Rhonda Ryan received a 10th out of the 65 entrants with a Bradford cross steer putting 3 Brafords in the top 10. A big win for the Brafords!! 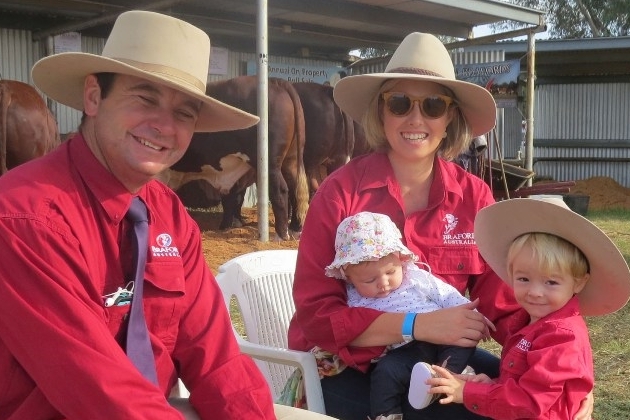 It was a boil over for local Braford breeders the Bennett family, Little Valley Brafords, at the Primex Bull and Heifer Classic held as part of the field days. 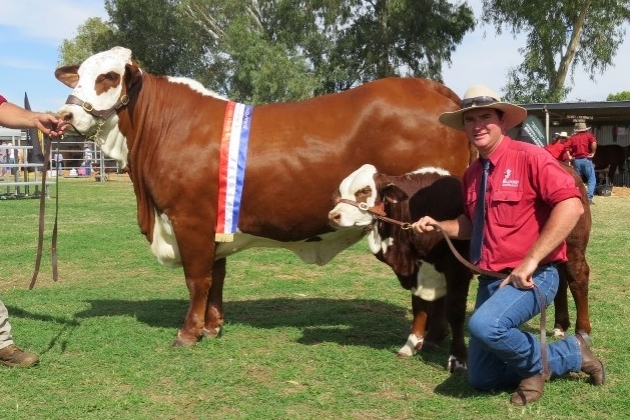 Little Valley Lady Brie was sashed the supreme exhibit after claiming senior and grand champion cow award is an sashed by judge Chris Whitney, held by Cameron Bennett, while Doug Bennett holds her bull calf at foot. Claiming the supreme champion exhibit was Little Valley Lady Brie, who earlier claimed the senior and grand champion female award. 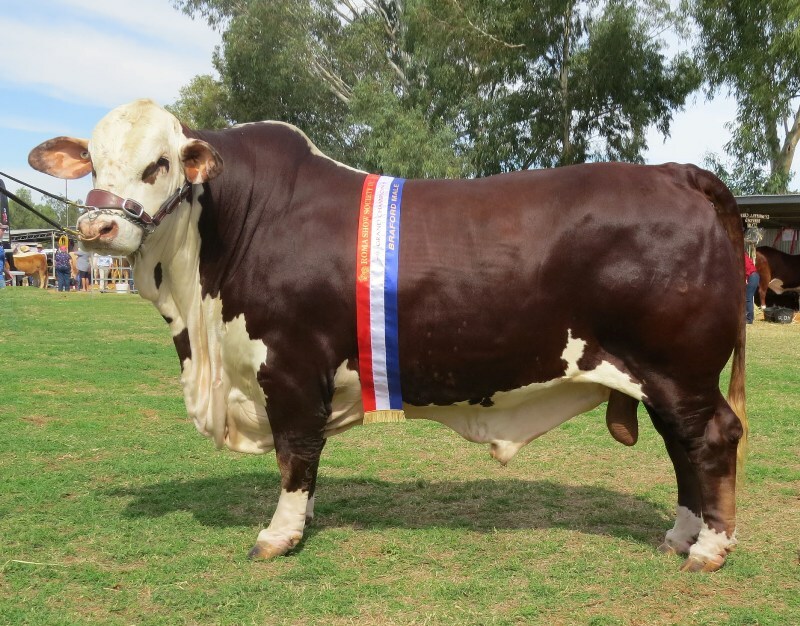 Exhibited with a handsome bull calf at foot, Little Valley Lady Brie is by the Queensland bred Taroela Lawson. The Bennetts bought Taroela Lawson, offered by noted Braford breeder Warren Wilson, Taroela Brafords, Mitchell, at the 2005 National Braford Sale.LIttle Valley Lady Brie was also the senior and grand champion female at the Braford Feature Show held at the Roma show earlier this year. 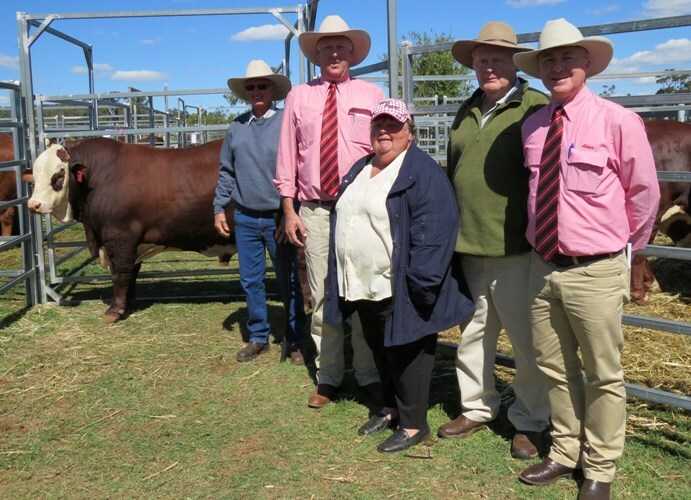 Judge Chris Whitney, Pocupar Poll Herefords, Old Bonalbo, NSW praised his supreme exhibit.“It really wasn’t an easy decision to select between a quality bull and this cow-and-calf package,” Mr Whitney said. “But in the end I went with the complete package, as she is a cow that I would love to have in my paddock. Continuing the winning streak was Little Valley Gilbert, who claimed the senior and grand championship bullribbon. Tipping the scales at 1040kg Little Valley Gilbert, is also a son of Taroela Lawson. 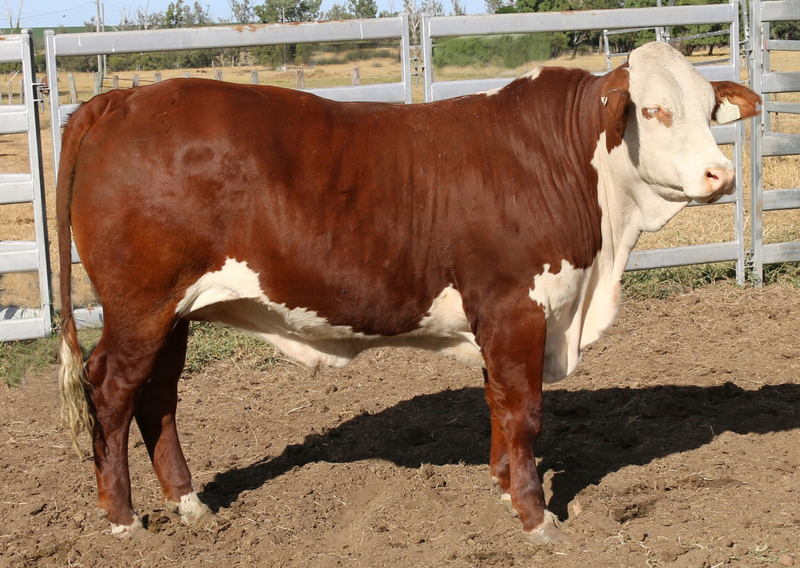 Little Valley Gilbert will be offered at the National Braford sale, Gracemere in September. Junior champion bull was Little Valley Hodges, who is a full brother to the Supreme champion exhibit. Article and photograph courtesy of Helen Walker Queensland Country Life. Class 56. Female – 9mth & under 12 mth. Class 57. Female – 9 mth & under 15 mth. Class 59. Female 18 mths & under 21mths. Class 62. Female- 30 mth & under 36 mths. 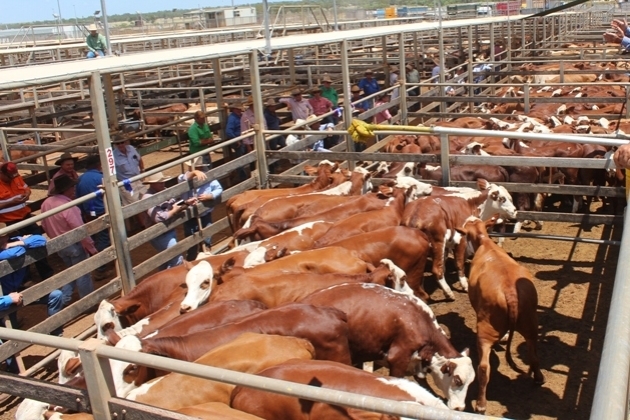 A total of 6000 head of cattle were consigned at Roma’s Store Sale on Tuesday 1st March. The sale included 650 head for the annual Braford Callte show and sale. 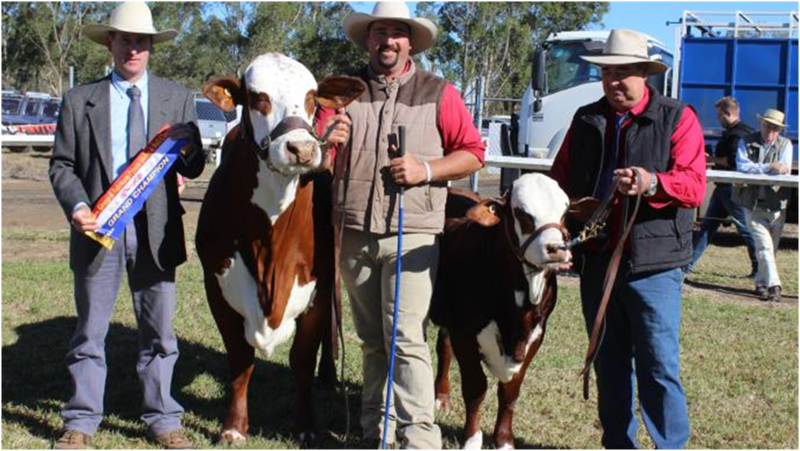 Grand champion pen of steers was awarded to the Kehl family, Wallumbilla for their pen of light weight Braford feeder steers. Wilson Grazing won the heavy weight Braford feeder steer section. In the heifer competition, grand champion went to Broadford Pastoral Co. The Stewart family won 1st place in the feeder heifer class and Broadford Pastoral Co won best pen of replacement heifers. 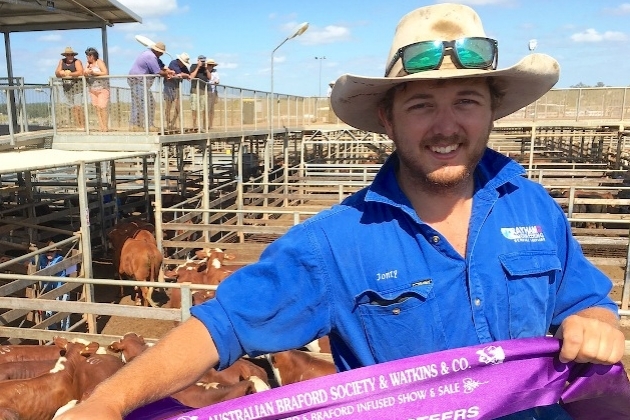 Broadford Pastoral Co, Broadford Hughenden, sold Braford steers to 378/kg for 231kg to return $874/head. 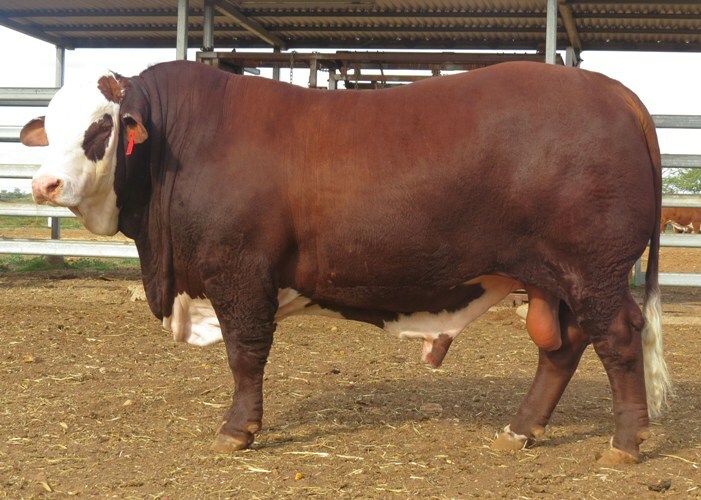 H, D & J Stewart, Wycombe, St George, sold Braford steers to 364c for 238kg to return $869/head. 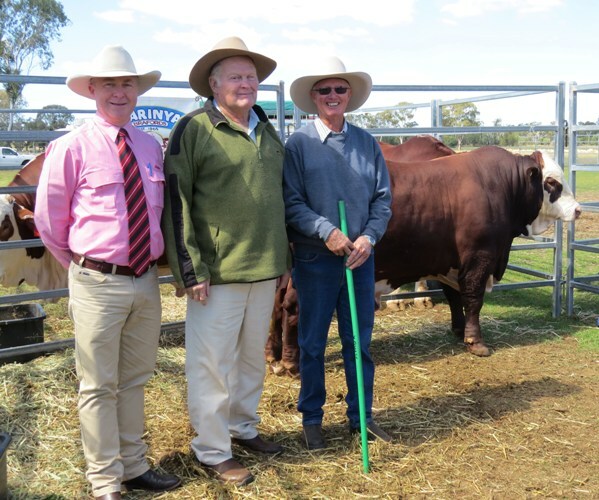 A & J Hay, Moonya, Wandoan, sold Braford steers to 340c for 358kg to return $1218/ head. M, T & J Kehl, Hillview, Wallumbilla, sold Braford steers to 334c for 442kg to return $1563/ head. 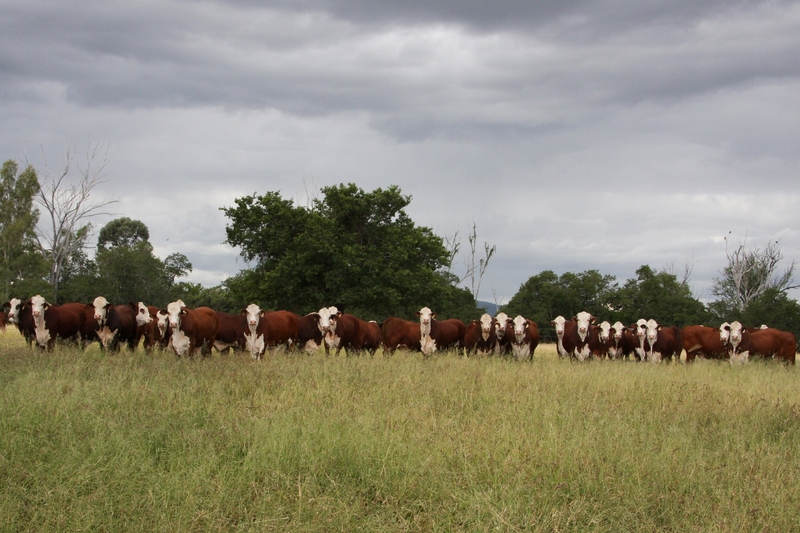 Wilson Grazing, Taroela, Taroom, sold Braford-cross steers to 332c for 470kg to return $1563 / head. 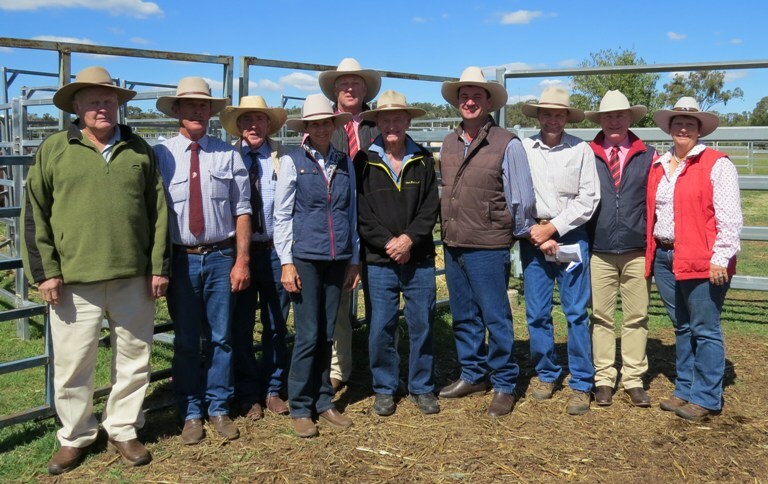 C & R Hay, Moonya, Wandoan, sold Braford steers to 332c for 394kg to return $1309/ head. Ashman Grazing, Escombe Downs, Winton, sold Braford steers to 330c for 404kg to return $1336 / head. Weaners under 220kg topped at 424c/kg and averaged 383c/kg, while weaner steers in the 220-280kg range reached 406c/kg and averaged 371c/kg . Steers in the 280-350kg range reached 389kg and averaged 343c/kg, and steers in the 350-400kg range reached 342c/kg and averaged 326c/kg. 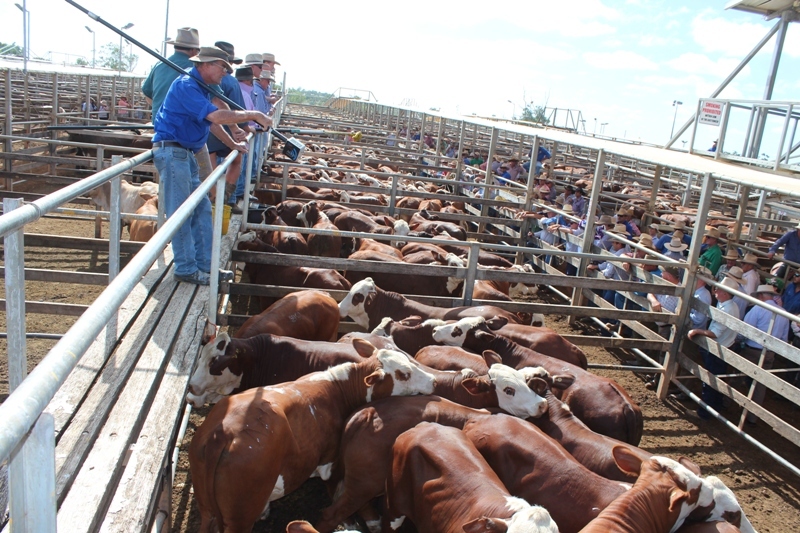 Feeder steers in the 400-550kg range topping at 335c/kg and averaging 324c/kg. Heifers in the 350-450kg range reached 320c/kg and averaged 290c/kg. Heifers in the 280-350kg range topped at 328c/kg and averaged 299c/kg. Heifers in the 220-280kg range topped at 362c/kg and averaged 317c/kg, while heifers under 220kg topped at 362c/kg and averaged 330c/kg.